This 'S' version is offered for "close up" finite working distances typical of machine vision installations. The recommended working distance is 644 to 2046 mm, although good images can be obtained anywhere from 421 mm to infinity. 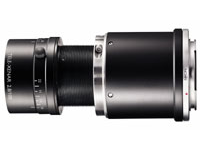 We also offer the 'L' version that performs best between 1548 mm and infinity. Good images can be obtained with working distances as short as 421 mm. Canon mount, V-mount, M42 mount and M58 mount also available.